If I imagine cherry blossoms' scent instead of chrysanthemums' scent (we visited Nara in early spring after all), this poem by 17-th century haiku master paints the picture I have of this town perfectly. It is a picture of the temples and shrines surrounded by thick forest, deer wandering the grounds of Nara park, colorful array of spring blossoms, and the tranquility presiding over it all despite the constant buzz of tourists and worshippers. On the other side, there is a picture of a modern Japanese town, with its restaurants and shops, rows of houses in the residential neighborhoods (with inevitable kei cars parked in front of each house), chain cafes and traditional Japanese sweet shops. Nara is an ancient town- it was the first permanent capital of Japan from 710 to 794 AD, and its two most notable temples and shrines date back to that period. The Todai-Ji temple was established as the head of all provincial Buddhist temples, and its influence over government's affairs grew so powerful that the capital was finally moved to Nagaoka. Todai-ji's main hall is considered to be the world's largest wooden building, and it houses one of Japan's largest bronze Buddha statues. We ended up not visiting that temple, but a couple of days later, we did see the second largest bronze Buddha statue of Japan- on an improvised day trip to Kamakura near Tokyo. Just for the reference, the statue in Nara is about 15 meters tall, and the one in Kamakura about 13 meters- you can see some photos of the later one in my post about Kamakura. We did, however, visit the Kasuga Taisha Shinto Shrine, whose legendary history could explain the presence of more than 1200 deer roaming the grounds of Nara Park. The story says that the god Takemikazuchi arrived in Nara on a white deer, to protect the newly established capital. 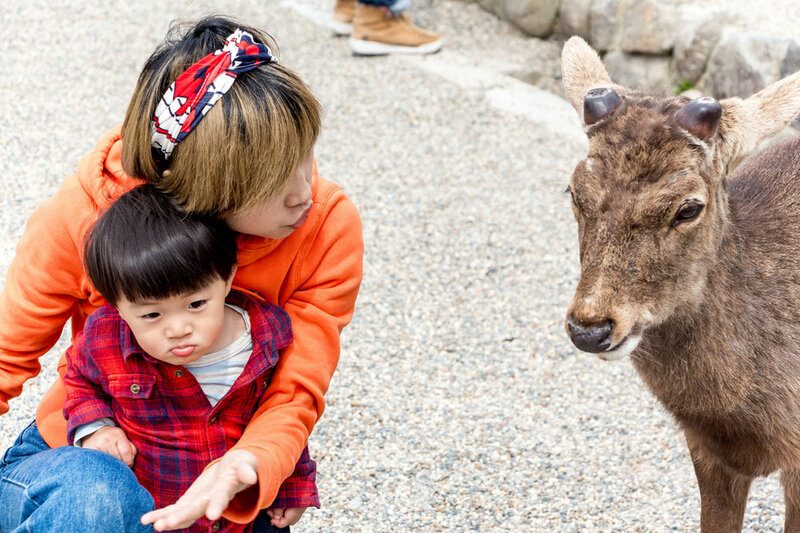 The deer have been regarded as heavenly animals and protectors of the town ever since, and are today one of the main tourist attractions of Nara. Both Todai-Ji and Kasuga Taisha are included in the list of 8 temples and shrines of Nara that have been proclaimed a Unesco World Heritage site. We started our day of sightseeing by stepping off the JR Station in Nara, and taking the main Sanjo Dori street heading to the Nara Park. Even though our main objective was to visit Nara's temples and shrines, we were soon distracted by the buzz and the shops of Sanjo Dori- stationery shops with beautiful calligraphy brushes, sweet shops selling intense green matcha flavored desserts and attracting a crowd with their mochi pounding demonstrations, souvenir stores selling deer-themed products, crafted in Japan and quite irresistible. Wandering Sanjo-Dori eventually got us to the park, with its cheerful crowd of deer and tourists: there were people feeding the deer with special deer crackers (sold on the site and called sika senbei in Japanese), people trying to catch a selfie with the animals, kids running around, at the same time enchanted and a bit scared of the deer that got too close. The Kasuga Taisha shrine is one of the most visited and most photographed shrines in Nara, known for its numerous stone lanterns that line the way to and from the shrine. The lanterns, called toro in Japanese were originally used in Buddhist temples, where they illuminated paths and were only later introduced to Shinto shrines as well. 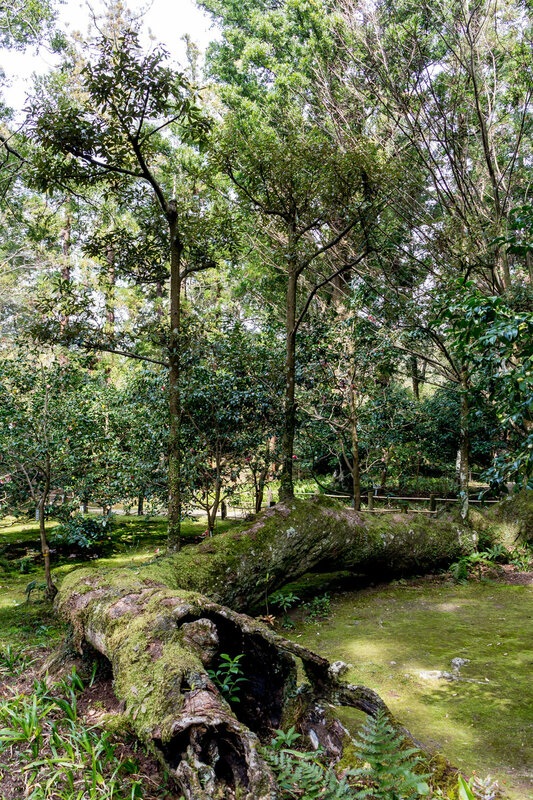 The Kasuga Taisha shrine is surrounded by Kasugayama Primeval Forest, another Unesco World Heritage site- that, along with the mossy lanterns, delicate cherry blossoms, and an occasional deer roaming its grounds made the atmosphere sublime and peaceful, despite the crowds. There was a path leading away from the shrine, through the woods, to the opposite side from where we came from. Again, as soon as we headed few steps away, we were almost alone. We had enough time for a walk along the path that passed by two more shrines and eventually got us out of the woods on the other side of the town center. We found ourselves in a quiet residential neighborhood, where the road was lined by family houses, a cafe here and there, and not much else. I would say that both of us have some kind of compass that leads us to cute things, and so we stumbled upon the cutest ceramic shop that featured two cats, lovely lady selling the ceramic and offering us some tea, tiny clothes stretched along the tree branches in front of the house, and some of the most beautiful ceramic we've ever seen. We were immediately attracted to the work of ceramicist Yasumi Koubou- her cups and bowls were delicately thrown and adorned with simple blue and yellow flowers, which led us to making some room in our luggage and heading home with two beautiful pairs of teacups and bowls. Those cups and bowls have been a constant reminder of our time in Japan ever since we got back. On our way back to the train station we got a bit lost in the maze of narrow residential streets (which was lovely by the way), and then eventually found our way to the center. I really don't know how and why we didn't find any restaurant for lunch (looking at Google Maps of Nara there are hundreds of restaurants, so it remains a mystery). We ended up in one of the chain cafes, eating croissants with chocolate (that's not a lunch, I know! ), deciding on where to eat when we get back to Osaka (our base for exploring the region). When I think about it now, I would love to come back to Nara, as there is still so much we haven't seen and its culinary scene definitely deserves a chance. As I mentioned in my Last year's favorites post, we are going back to Japan this year, and soon. Last time, we visited Tokyo and a couple of other well-known cities such as Osaka, Kyoto, Nara, and Kanazawa. This year, we're heading to lesser known places of Takayama, Shigaraki, Okayama and Naoshima island, but also to the buzzing cities of Nagoya and Kobe- needless to say, I am very excited and consequently inspired to share more of our Japanese travel stories here. I hope you'll stick around and if you have any Japan experiences to share, please do! My broken Yasumi Koubou's cup! Beautiful, even in this shape.